The main cast of "The Misadventures of Sheriff Lobo". 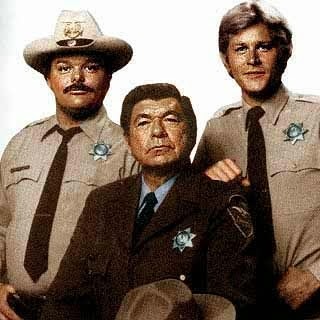 From left are Mills Watson, Claude Akins, and Brian Kerwin. It is rare when the bad guy in one show can become the good guy in another. Usually bad is bad and good is good, and never the two shall meet. Except, way back at the end of the 1970s and the start of the new decade with a show called “B.J. and the Bear”, and an unlikely spinoff that co-starred a familiar face. “B.J. and the Bear” featured a truck driver, B.J. McKay, and his best friend Bear, who was a monkey named after legendary football coach “Bear” Bryant. They would travel the countryside finding adventures. One of the spots B.J. visits is Orly County, patrolled by the conniving, weaselly Sheriff Lobo, played by Claude Akins. 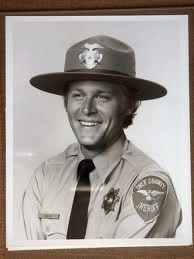 He had two deputies: Perkins, played by Mills Watson, who was inept and bumbling, and Birdie Hawkins, played by Brian Kerwin, who was honest, naïve, and referred to Lobo as his hero. Sheriff Lobo proved popular enough he made more appearances on “B.J. and the Bear” then he was spun off to his own show: “The Misadventures of Sheriff Lobo”. Now, Lobo was the protagonist with his two deputies. After the first season, the show was restructured, likely to prop up ratings. It was re-named “Lobo” and the boys all moved to Atlanta, where they sailed on into that good night. Sheriff Lobo did make a return to “B.J. and the Bear” but that would be it for our bad guy turned good. Brian Kerwin as Birdie Hawkins. starring role on "Blue Bloods". Birdie Hawkins was actor Brian Kerwin’s first recurring role, but he would find success as an actor to this day. In the 1980s he guest-starred in TV shows such as “The Love Boat”, “Simon and Simon”, “Highway to Heaven”, ”Murder, She Wrote”, and “St. Elsewhere”; theatrical movies such as “Murphy’s Romance”; and various TV movies and the mini-series “The Blue and the Gray”. He continued that success on into the 21st Century with movies such as “The Help” and “27 Dresses”; and a lot of guest roles on TV including: “Law and Order”, “The West Wing”, “Grey’s Anatomy”, “Nip/Tuck”, “Desperate Housewives:, “Without a Trace”, “Big Love”, and much more. I recently saw Kerwin on an episode of “Blue Bloods” on DVD, which inspired this entry. 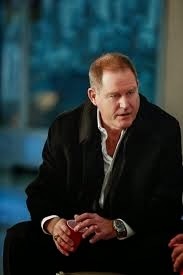 Brian Kerwin is another one of those durable actors we all know when we see him, because he seemed to be in everything, back in the 1980s and now. But he really got his start worshipping a corrupt sheriff who, despite himself and his best efforts to do the wrong thing, always seemed to get the bad guy, and doing the right thing in the end.